Chinese investors and young US entrepreneurs called for more cooperation between the world's two largest economies. "We entrepreneurs from both the US and China have the same startup experiences and all of us spared no effort to do that," said Patrick McFarland, founder and CEO of Korwave, a high-tech startup in the US developing wearable devices monitoring pet's health. He made the remarks while signing a letter of interest with a Chinese investor at the China-US Dialogue for Investors and Young Entrepreneurs held by the All-China Youth Federation on Friday. "So, we can have very strong cooperation relationship and friendship," McFarland said. The investor, Xiao Qiangwu, board chairman of Beijing-based Source Maker Group, said he would invest $300,000 to $500,000 in both Korwave and another startup from the US called Dream Outside the Box, which aims to help children discover potential occupations. "Compared with Chinese youth, young entrepreneurs from the US seemingly have more passions," he said. "Both startups have the intention to utilize their products to contribute to public benefit, which also impressed me." According to McFarland, his company is developing special wearable equipment to help record real-time physical condition, which was inspired by his sister's epilepsy, which can bring severe symptoms suddenly. "But there are many hardships to develop such equipment for humans directly, so I turned to those for pets," he said. "To let Chinese benefit from our products in the near future, I decided to promote our business to China." 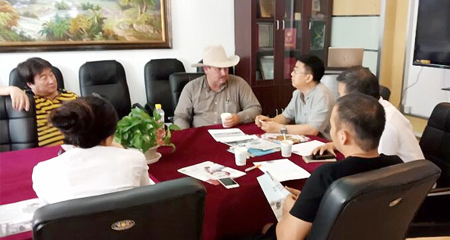 McFarland said China investors can help his company better understand local consumer's various needs and cope with governments and other business-related concerns. Xiao held the same opinion of McFarland. "We help them not only in capital, but also to fit in with the Chinese market," he said. "For example, we can utilize our local interpersonal network to facilitate their expansion in the Chinese market." "They grow better in China, and we will have lower investment risk," Xiao said. Li Keyong, Head of the All-China Youth Federation, said startup business is a new sector where China and the US have a common interest. "Youth have the most creativity and the spirit of innovation, so China and the US can have more cooperation on youth entrepreneurship," he said. "China firmly protects intellectual property to create a better startup environment," Li said. "It will be promising for US youth entrepreneurs to combine advanced technologies from US with the Chinese huge market."